(Late this week too! I'll get back to my schedule of publishing these on Sundays next week, promise.) I envy other people's way with words: their brevity, economy, or perfectly pitched descriptions. This is why I love reading so much. In a few words some writers manage to describe an often-felt but barely expressed sensation, and I have to stop to let it sink in. Something about their writing has made me want to reread it, savour it, gnash my teeth with envy and wonder how I'll ever be able to say anything that well. So far I haven't. When people ask me about the progress of my book, I say it's getting longer but not any better. It's not what I want it to be. It is patchy and full of notes to myself ("expand", "another childhood memory here", "make this better! "), and through writing it I'm finding my way a bit. It won't be until at least the second draft that it's even legible, let alone any good. I've taken some solace from a few things I've read this week, however. Jane Wenham-Jones admits that her first draft is often way short, and full of notes. So far the only writer I'd read who'd gone into that level of detail was Stephen King, who is sickeningly prolific and has a rule: the second draft = first draft - 10%. It was therefore heartwarming to read someone else who comes up short at this stage. I also read that DH Lawrence said that he wrote his entire first draft, threw it away and then started again from scratch (I can't find where he said that, but I'm going to hope ferociously it's true). The first draft is almost a training ground for me. I have in my head a vivid sense of the whole of my book - what I want it to be about, the story I want to tell. I have practical goals too: I want to write x,000 words a week, have a first draft done by Christmas. The trouble is, none of that helps with the daily chipping away at a story, knocking at an idea until it reveals itself fully formed. My ideas may be vivid, but they are not clear. When I actually sit down to write it, my attempt at expression of all these wonderful themes and stories ends in a few abrupt words or a lumpen paragraph. This week I wrote a scene that ended after a few paragraphs, when I ran out of ideas. None of the delicacy of thought I had in mind was possible in such a short passage, and I was disappointed, but determined not to garnish the story unnecessarily (every sentence should either "add to the plot, or reveal character", is the common advice). Besides, I had no time to elaborate, as I was getting it down. I wasn't even sure I was able to get down what was in my head, the mass of thoughts and ideas, into anything as coherent as a story. A few weeks ago I realised there was nothing coherent about the story in novels - they are messy things - but where did that leave me? I fretted about my structure. I got bored at the scene I was in, and wanted to jump to others. More than anything I felt anxious about moving on, getting to the next bit. At this rate the first draft of my novel would be about 50,000 words (the average is 100,000). 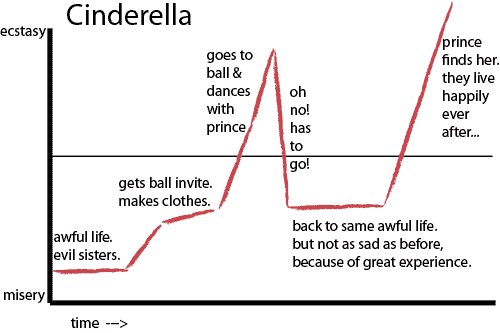 The trajectory of a fairy tale is relatively simple: a red line surging forward like one of those bikes in Tron. Come to think of it, there's something fairy tale-ish about Vonnegut's books. His characters are unable to change anything, are powerless in the face of the world (is this true of sci-fi in general? I haven't read enough to know). The moral of Cinderella and Cat's Cradle is the same: so it goes. At the same time, I'm reading On Beauty by Zadie Smith, who is one of those writers who makes me throw my book down with jealousy. Reading it made me realise the careful and deliberate way Smith reveals character and conflict, and all those storytelling buzz words. They are present in every sentence she writes. One scene was so fraught it had me bracing my shoulders, as if the tension were above my head, weighing it down. Conflict is not the progression of a line; every scene should bristle with it. Particularly for me, it meant characters shouldn't spend long on their own. Not enough happens that way. They shouldn't buy coffees and think about things in cafes (one of my godawful early attempts). They should bump into each other, have words, not say what they mean. And most important: as a reader, I am not aware of the overarching story. Perhaps, as I often do, when I finish the book I'll think about all that, go over the structure in my head, break it into turning points and crises and climaxes. But at any one point in a book, I am in the moment, in that particular scene, reading as a very real problem or insight unfurls. So I took the few paragraphs my first attempt at my current scene had produced, and unfurled each one, like tightly rolled cigarettes. A scene of three paragraphs became 26, but the action remained the same, I just followed the densely packed ideas a little more thoroughly, and a little more leisurely. I'm getting better at writing in the scene, to coin a poncey phrase. Not worrying what comes next, but thinking about the situation, what's going through the mind of each of my characters, how would they react? It'll need editing, but that's for draft two.